Ok, I'll PM you the sprites when done. I have a question how do the people get their childboards? You mean subforums for your project? You just have to ask a moderator/administrator. Yeah, just PM me or any of the other staff, and we'll get you sorted out. You should start working on the project first though, and only get a subforum once you have a couple maps done and some screenshots to show. I'm working on a map that has A HUGE secret room, but it's very hard to find. It's probably going to be used in ANQ, but it's not gonna be total crap like the previous maps were. It's gonna be challenging, nicely detailed, and....yeah. That's it. Also one more question how many bits is chex quest 16 bit or 32 bit? 16 bit, I think. That's offtopic though. I just needed it for spriting in gimp. Really? Then if I port ANQ to GZDooM then I don't need the DooM palette file for GIMP. It's good to have, though. Note that this doesn't stop you from using true color pngs in zdoom, it will do its best to display them but if you use a lot of cyan it will look awful (compare the CL zorcher in Chex Pack in software and opengl mode to see what I mean). However, gzdoom and zand's hardware renderer has true color, you can use any color you want. Thanks I will be using any color. It is impressive that DooMs engine is 8 bit but look more 16 or 32 bit. Yeah, my mod is supposed to run on any platform, so I'm using a palette file to make sure I have the correct colors. It's very handy for DooM and Chex Quest spriting. Typically when people talk about "16 bit games" they're talking about the CPU bit width, not 16 bit color, game boy color (which was 8 bit) usually had far less than 255 colors shown on the screen at once if I recall correctly. 8 bit CPUs severely limit how big your program can be, and how much memory the system could have (plus they were generally slower), that's why 8 bit systems like the NES had much simpler looking games than 16 bit games like the SNES. I thought the commonus looked really lame as a biomechanical creature with no arms, I made them. Yep, very short. I'm gonna get to work now on firing frames and the like. 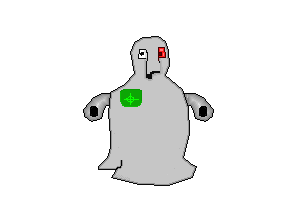 Walrus, I'll PM you the sprites when done.